A woman jumps over a barrier to kiss Adolf Hitler,1936. 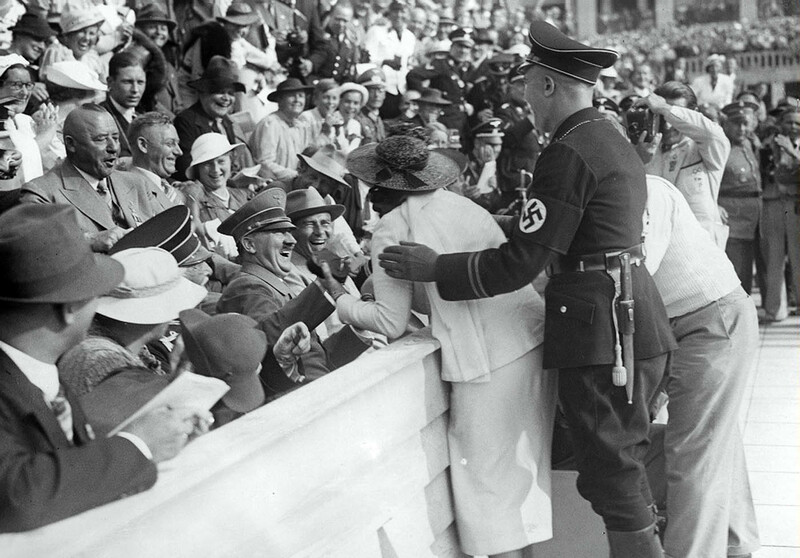 Shortly before the finish of the men’s 1500 meters free-style swimming, a woman in a red hat, whom Black Guards repeatedly prevented from photographing Hitler at close range, broke the cordon during the excitement of the finish of the race, shook Hitler by the hand and then kissed him, while the crowd of 20,000 rocked with laughter. Hitler, who was in high spirits, joined in the fun, clapping his hands as the woman returned triumphantly to her seat. The woman, Carla De Vries, was a 40-year old American traveling in Europe. Her brother-in-law was quoted in that “She wanted to meet Hitler but I’m surprised at the way she did it”. Her rationale from her own words? “Why? I simply embraced him because he appeared so friendly and gracious. People sitting near Der Fuehrer’s box began to cheer and applaud so loudly that I ran back to my husband and told him we had better leave. I don’t know why I did it. Certainly I hadn’t planned such a thing. It’s just that I’m a woman of impulses, I guess. It happened when I went down to take Hitler’s picture with my small movie camera. Hitler was leaning forward, smiling, and he seemed so friendly that I just stepped up and asked for his autograph, which he wrote on my swimming ticket. He kept on smiling and so I kissed him”. For their failure to halt the woman, several of Hitler’s hulking Schutzstaffel guards were dismissed in disgrace, several more were demoted in rank.